Dumont Pro Painting Services, Inc. Comment: We have two story, 5000 sq. foot concrete block and brick home. We want the whole house brushed with waterproofing primer (i.e., Drylock, Sherwin Williams Loxon Primer, etc.). Final coat is white. No spraying on any portion of the job. Minimal rotted fascia repair may be needed. No windows need to be painted (windows are inset in block sills). Job includes painting interior of attached one car carport, concrete front porch and step surfaces, decorative wrought iron on front porch, 8 exterior doors, 1 set of exterior French doors. House will need to be cleaned and prepped, minor cracks filled, etc. Art Inherited of Land O' Lakes, Inc.
2814 Land O' Lakes Blvd. Tampa Painting Contractors are rated 4.82 out of 5 based on 1,940 reviews of 146 pros. 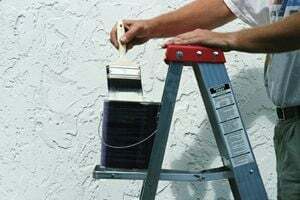 Not Looking for Painting Contractors in Tampa, FL?